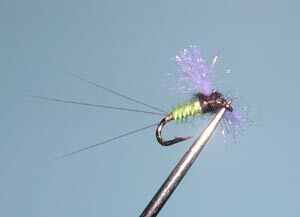 The Trico Spinner Fall can be the highlight of any flyfishing excursion within the Sierra. This activity is found usually in areas of slow moving creeks and streams as well as lakes. The males hatch during the night and remain near the stream banks. During the early morning, the females will hatch and become sexally active. A swarm of activity between the males and the females takes place , usually around 8:30 am. Soon afterwards, the males start to die off and will litter the water surface. Sometime around 11:00 am, the females return to the water to lay eggs and die off too. This is the time to switch from a male Trico spinner pattern to a female spinner pattern. The males can be distinguished by a black abdomen, the females tend to have a more pale olive abdomen. This hatch requires a long fine leader and drag-free drifts. 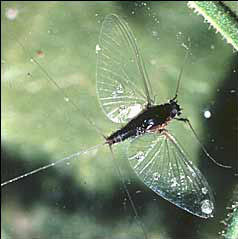 The use of fibers for the spent wings was an innovation of Vince Marino, who noted that the use of fibers condenses the water between them and creates streaks of light when viewed from below the surface. Barry Beck improved on the pattern by introducing synthetic material such as Antron, many tiers prefer to use this material in a light grey color rather than white. 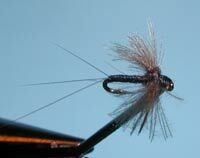 The pattern I have depicted here is one tied by John Betts, utilizing a light Olive turkey biot for the abdomen. Perfect for the female Trico Spinner. The wings do not have to be tied horizontal as many spinners have a slight tilt upwards.